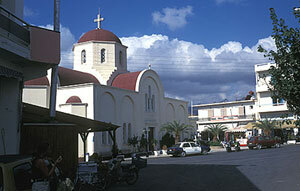 Palekastro, as we know it today is a newly established village since it was founded in 1850. It took its name from a nearby hill called kastri (Castle) where you can still see its ruins today (old - castle). Decisive factor in the making of Palekastro was the monastery of Toplou. The monastery owned a vast area that spread out to cap Kavo - Sidero. Within this area the inhabitants of the mountain regions (Magasas - Mitato), migrated after then monastery gave away parts of land. That's how Palekastro came to be as we know it today. 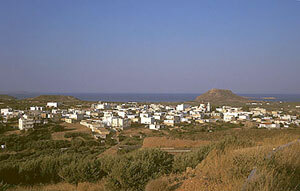 Two independent cities thrived in antiquity ITANOS and ELIA. Ancient city built in today's position of Rouso - Lakos was called ELIA (1960 b.c.). Well designed functional Minoan structures of the after - Minoan era. Skeleton traces of early and mid - Minoan era gives the feeling to today's visitor of an untouched Minoan city with broad roads and large building blocks. It is considered the second in size ancient Cretan city after Knossos. Excavations carried out even today by British Archeologists, revealed important findings as the sacred temple (Dikteou - Dia) at the tip of mount Petsofa, (steep mountain in the south of Rouso - Lako). 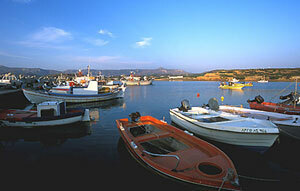 Many of the important archeological findings are on display at the museum of Sitia, Iraklion and at foreign museums. Lately an important archeological discovery was a statuette 50 cm tall made of gold and ivory that constitutes a magnificent piece of Minoan Art is said to represent a Minoan young god and can be viewed at the museum of Sitia. 8 km south - east of Palekastro at the tip of the picturesque harbor of today's Erimoupolis you can find the ruins of the historic city of ITANOS. A city which in antiquity was inhabited by more than 10.000 people and was one of the most important ports of south - eastern part of Crete. It had commercial and political relations with Africa - mostly Egypt. The biggest part of this glorious city lays today peacefully at the bottom of the ocean.